Started off at 8am and had quite an easy drive through very scenic country. No sign of the drought, with green hills and pastures all the way. Loads of cows and sheep, some of the sheep with twins and triplets. Visited Mt Monster Conservation Park (approx. 10kms before Keith), for a picnic lunch. A beautiful setting of Ozzie bush, on a granite outcrop, dating back millions of years, when it was once covered in the sea. When the sea receded, sediment was the only thing remaining, covering Mt Monster and today, millions of years later and after sediment has been washed away, the granite outcrops are the feature. A perfect setting for a rest and lunch, though rather cold. 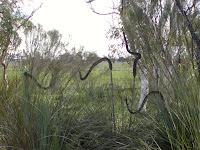 Amongst eucalypts, banksias, correas, we spotted these grass trees with ‘attitude’! 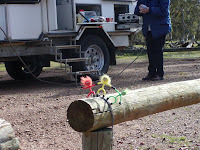 Rhys and Heath, can you spot the magnet men on the grass trees?